It is now possible for entities based in Norway, Iceland and Liechtenstein to register domain names under .EU domain. The .EU Domain Registry has announced that residents, companies and organisations located in the European Economic Area countries of Norway, Liechtenstein and Iceland can now register .EU domain names. It has long been awaited as a positive development in enhancing the .EU’s unique brand image and strengthening the economic ties within the European Community. Granting Iceland, Liechtenstein and Norway access to the .EU top-level domain seems to be a natural step forward in that direction. Research shows that .EU domain is perceived as a reliable and valuable online label. 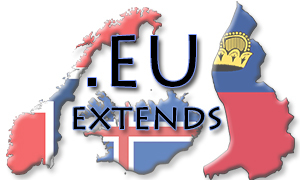 The companies and residents of Norway, Liechtenstein and Iceland should soon appreciate the advantages that the .EU TLD offers, particularly strong security procedures for its databases and management.